As she struggles to deal with the loss of the only family she has ever known, twenty-year-old Lina’s strange visions catapult her into the midst of a war on the other end of the universe. Before I start reviewing the book, I want to thank the author Leah Lozano for selecting me as one of her book reviewers. I feel so honored and I'm glad that I'll be able to do this for her, in exchange of that is an honest review. Due to busy schedule, I just had a free time and started reading it January this year, at first I thought it was spooky. First few chapters and there were so may questions in my head already like who was the guy in Lina's dream, who's voice is she hearing? Who's Archos? and so many other things. With those questions it made me want to read more until I reached the moment where Archos.. is a guardian, and the kind of man who will make you swoon. 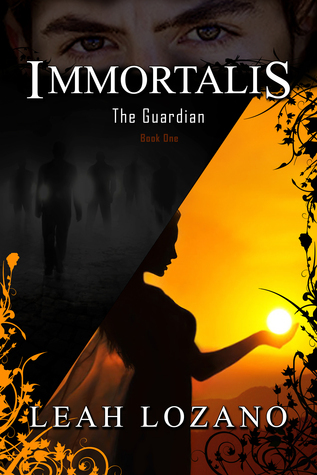 Archos is one of the guardians who they call themselves immortalis, he's been protecting Lina without her knowing for a long time since she gets back to her grandmother's house. He's been secretive yet one thing is obvious, he is in love with Lina. Lina on the other hand didn't have any idea that she's something special and part of the immortalis. She likes Archos but she didn't even know who he really is in the first place. Archos and Lina are both under the forbidden love. Aside from Archos, there was this man on Lina's dream, a man who wants to own her for uncertain reason. She believes that this man is her soulmate but between Archos and the-guy-from-a-dream, who is her real soulmate? The book gave me different emotions but mostly I didn't expect that I will be really excited reading and finishing this. I can't even wait for the next book! There are still so many unanswered questions that readers should have to wait until the next book comes out. This book is really good, promising and swooning (oh dear Archos). I haven't read a book with this genre for a long time but this specific book makes me wanna read more. All in all I had a great time reading the book. It was beautiful and pleasurable to read.